29-Oct-2004 -- We were 8 friends driving on a motorcycle trip through Mauritania and hoping to prepare Paris-Dakar that we might experience one day. We've had a rough 8-day trip from Nouakchott to Atar through the desert. Among some of our drawbacks were that we lost a friend who had to go back to Belgium on a plane because he broke 2 ribs and his collarbone. The next day we found out that we did not bring our repairs, so sacrificed one bike for spare part. The other next day we broke one of our assistance vehicles and had to wait in the desert for 1½ days in 50°C heat for a repair to come back to the RV point somewhere in the dunes. All this did not set us back, and the camp fire at night and the great exhilarating driving in the desert gave us still the thrills that we longed for during our 2-year preparation. 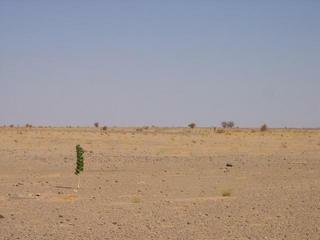 We knew that there were 89 confluence points still to explore in Mauritania. We had logged them all in our GPS receivers, and on our way to Atar even came to 75 m close to one of them, but were so tired and thirsty that we didn't stop and just continued. However, on our way back from Atar to Nouakchott we decided to go for one of them. 20N 14W is only at 5 km from the tarmac road between these two cities. We headed for them and logged the point on our GPS. There isn't a lot to see on 20N 14W but we felt historic to be on a non-explored confluence point. Next trip we'll just make a confluence trip and log the other 88.